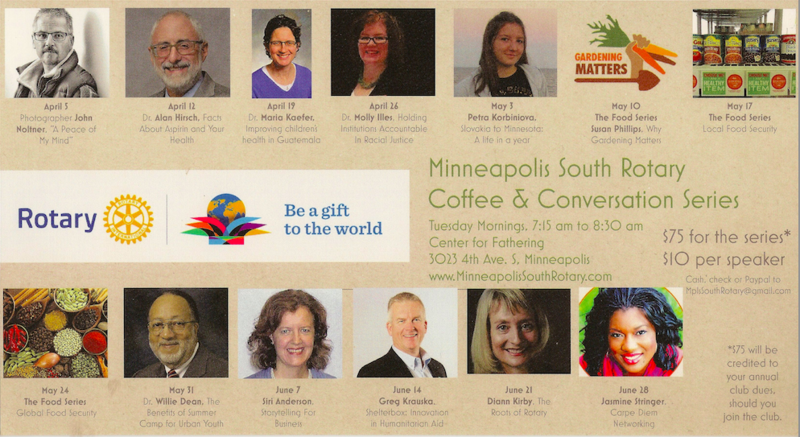 Join the Minneapolis South Rotary Club for its spring Coffee & Conversation series. These speakers are timely, interesting and will give you as much energy as the coffee or tea that we'll serve you. It is an intimate setting where questions and interaction with the speaker is not just welcome: it's encouraged. The cost is $10 per speaker, or $75 for the series. If you buy the series and decide to join the club, $75 will be credited to your first quarter dues.